There isn't a better medium-size charcoal grill than the Weber One Touch Silver Kettle Grill. If you have never used a Weber grill, you are missing out on a great grilling experience. This Weber charcoal grill is my go-to grill for everyday grilling. I love the large 18.5″ grilling surface because it allows me to cook enough meat or seafood for guests. In my opinion this is the best charcoal grill in its class. It is also at a perfect height and I particularly love the fact that it is on wheels which makes it very easy for me to move it around my deck. I was using a Weber Smokey Joe grill for the longest time and decided to jump it up another level and I haven't looked back yet. 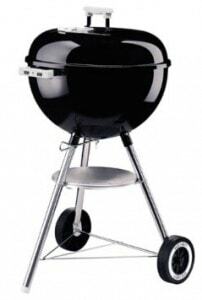 I looked at the various model sizes and decided on the Weber One Touch Silver Kettle Grill. Here's a quick pictorial tutorial on how to barbecue a whole chicken on my Weber One Touch Silver. The Weber Smokey Joe was a little small when I had to grill for guests but I will never be without one due to the portability of that grill. My new Weber One-Touch Silver is seeing a lot of action these days. There is something unique about the Weber charcoal grill dimensions that cooks food perfectly. The Weber kettle grill design is unmatched in the marketplace. Believe me, I have tried the phony knockoffs and they simply don't work like a Weber grill. The Weber kettle charcoal grill has always been the best charcoal grill in its class. Another positive aspect of my One Touch Silver is that the grilling surface is large enough for my Weber rib rack which is quickly becoming one of my favorite grilling accessories. Very easy assembly. You'll be grilling within minutes! Wheels make it very convenient to move around even when hot. If you think you have grilled at a high level without a Weber grill, pick up a Weber One Touch and you'll be thoroughly impressed with it. The large grilling surface, mobility, and Weber quality will make it a worthwhile investment. Once you turn to Weber when it comes to charcoal grilling you will never go back to the imposters! tempus neque. porta. at Phasellus facilisis ante.